Potted, the coolest garden store I’m embarrassed to say I have yet to visit, is having a ‘That’s So Potted’ Contest. The rules are pretty simple: enter a picture of my “favorite container planting” and get everyone I know to vote for it. Be most popular, win! Easy, right? Wrong! You know I couldn’t just enter something I already had, so I created four new and very different planted containers. Great, but here’s the thing: I can only enter one in the contest. That’s where you come in. Please help me decide which of the four I should submit … and then please vote for it once it’s entered. The prize is an awesome $500 shopping spree at Potted (and Daddy has a vintage chair he needs restrung)! At the end of this post will be a poll where you can check the pot you like the best. Your fave will be my entry. 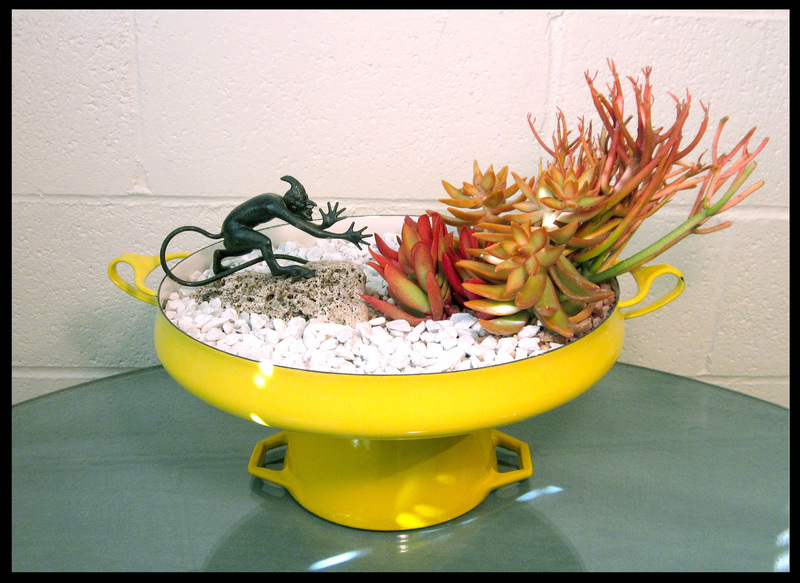 The inspiration for this container planting came from the hot colored succulents in the Rancho’s garden and my very dramatic cast-iron devil figurine. I’ve had el diablo forever and always loved his sinuous good looks and the way he seems to be in the act of conjuring something up. So, why not fire itself in the form of hot orange and red succulents, and the aptly named sticks-on-fire in hot pink? White gravel chips, a lava rock and a sizzling yellow-enameled vintage paella pan lend contrast to the devilish display. I love this one! I’ve always been mystified by these garish little grafted cactuses. These plants, in bizarro, almost-neon colors and goofy shapes, can often be found in tourist shops and dime stores (wait, does anyone use that term anymore? ), although I got mine at Lowes. I picked them up because they reminded me of these similarly goofy little pop-up figures from the 60s. About the same size as the cactuses, and brightly colored as well, they each have a slogan inside that appears when you slide them down toward their feet. For example, the slogan that appears in the slot of the voodoo doll figure’s head reads, “THINKING OF YOU”. Zany! 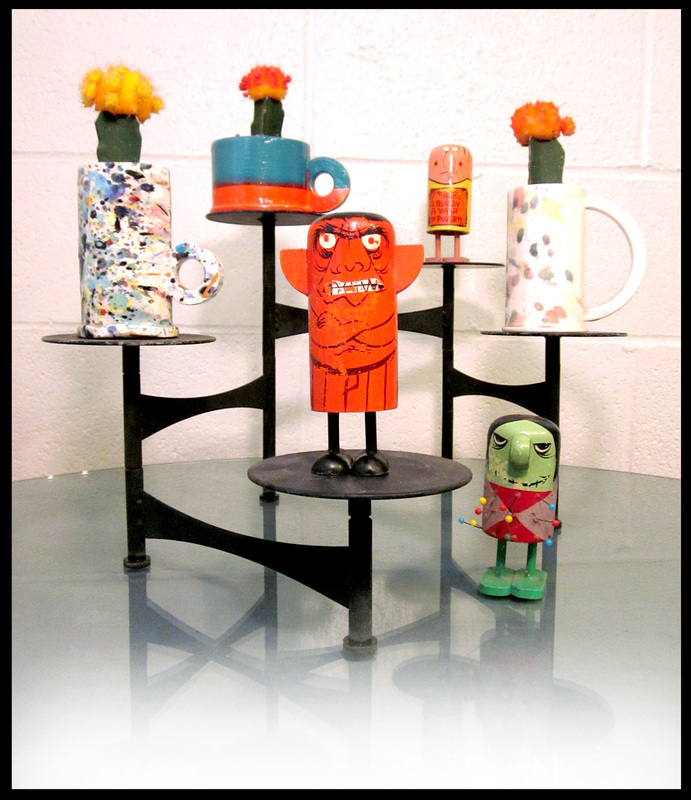 To present them, I’ve potted each cactus in a teacup by LA artist Peter Shire’s studio, and arranged them, and the figures, atop a hinged metal space-age display piece. The black metal really sets off the colors of the cactuses, the teacups and the figures perfectly, and it’s just as wiggy as the stuff it’s displaying. Goofy fun! 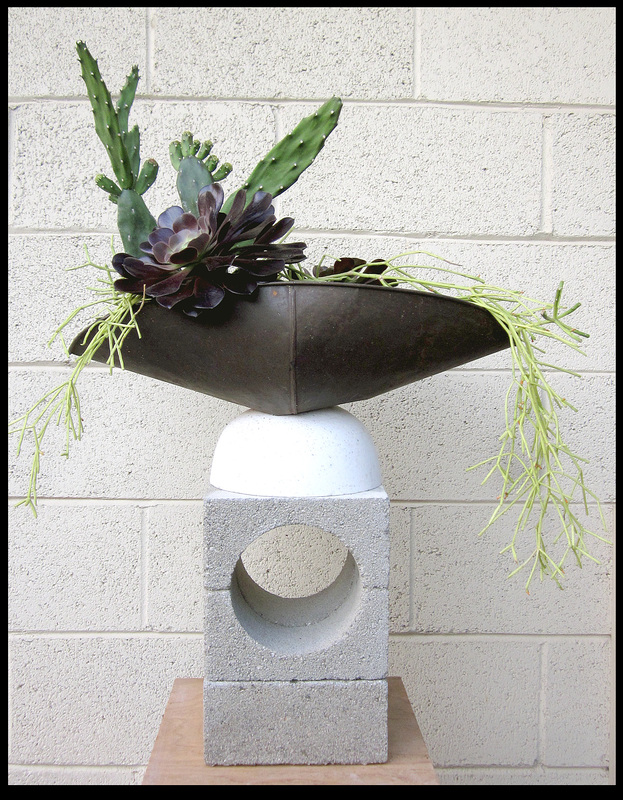 An old market scale’s weighing tray was the inspiration for this stacked urn. I loved the rusted crescent shape, and with some deft shaping and bending, I got it to look something like an inverted hat Napoleon might have worn. For height, I placed it atop an overturned mod pot in ceramic, and stacked all of it on an arrangement of vintage cinder blocks. To echo the ruddy metal container I planted rust/black aeoniums, along with shapely cactus. Next, to add both contrast in shape and color, a spindly succulent in lime green traipses down each end. Unseen, smooth black river rocks provide top-dressing … Nice implied classic shape, rough textures and simple geometric forms: a DIY masterpiece! Ringo-inspired whimsy and a chance to use a very 70s crunchy-granola pot were the triggers for this container. The crackle-glazed ceramic octopus with the goggle eyes and benign grin came from an antique mall in Yucaipa and the pot from a neighbor’s estate sale. Undersea-lookalike succulents are nestled in the octopus’s curving arms and a flapjack kalanchoe explodes like giggle bubbles from his head. 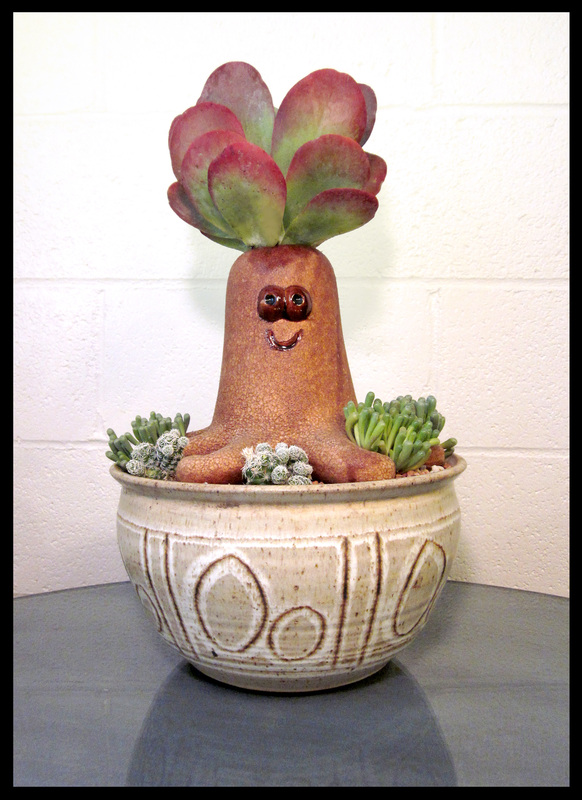 Purely for fun, this is a happy little planted container that I could see cheering up both shut-ins and stoners alike. Thanks for voting! Once I enter the contest I’ll post a short notice with a link to the Potted site where you can vote for the favorite entry. Of course, I’ll let you know how we do. Entries are posted every Friday for voting on the Potted store blog, check them out here. Maybe you’d like to enter your own! I love it! A contest for a contest. I can’t wait to see what wins. I voted for Fire Starter. Ha! I know, I just couldn’t decide which … thanks for voting Annette! I liked KLASSIC’s final proportions, too… but my fave’s FIRESTARTER … Now, I don’t feel so bad since you’ve not been to Potted yet, either. Are you entering the contest? Funny I was just looking at the entries on the Potted site. Firestarter is amazing!!!! And Klassic is pretty cool too. Maybe you enter one and Paul enters one. Would that be cheating? How funny, you were just looking at the Potted submissions … I have a feeling FIRESTARTER’s gonna be the winner and my entry. As for Paul entering one, hmmmm……. I voted for Firestarter too—you can almost see the heat waves pressing the arrangement out to the right. Inspired . I would have voted for Firestarter, but I cannot condone using what looks like a perfectly good Dansk paella pan in this manner. It is great, though! I voted for Weirdos, because you never see those neon cacti in succulent arrangements, and it’s got fun colors and rhythm. You’re giving me ideas! Ha! We’ll since I don’t have time to actually make paella these days it’s nice to see the Dansk being used for something, right? And I’m happy I’m giving you ideas … send pictures! yes, pot-ted is the coolest. no, i haven’t been yet either. firestarter has the visual punch, and also the power of a narrative. probably the best pick. and klassic was an excellent study in balance, proportion, scale, materials, etc–and lovely! for some reason, i loved octopus’ garden. that goofy ’70s pottery is getting to me lately–must be a nostalgia pick. best of luck!! You see my dilemma — This is why I enlisted y’all’s help … I’m starting to like develop a feel for the roughness of 70s pottery too… thanks for voting! Thanks for weighing in, Megan! Wow, bravo !!! I love the firestarter but Klassic is also very cool. You are so creative. I adore your ideas. Hey, I think so, too… but is it a winner? So far FIRESTARTER’S the one!